The Great Jubilee of the Year 2000 ended on 6 January 2001 with the closing of the Holy Door of the Vatican Basilica. Since that time, the Holy Door has been the principal reminder of the Jubilee celebrations. Anxiously awaited and then celebrated in the series of events which began on Christmas Eve 1999, the Jubilee is now mostly a memory. But the desire to remember it leads the many pilgrims who daily visit the Tomb of the Apostle Peter in the Vatican Basilica to halt before the Holy Door. These nameless pilgrims who gaze at the Holy Door testify to a vivid desire to relive the great event of the Jubilee. The story of the Holy Door and the extraordinary, grace-filled events which took place between Christmas 1999 and Epiphany 2001 needs to be told. Pope John Paul II himself said as much: “What we have observed needs to be reconsidered and in a sense ‘deciphered’, in order to be able to hear what the Spirit has been saying to the Church (cf. Rev 2:7,11,17, etc.) during this most intense year” (Novo Millennio Ineunte, 2). In this volume the Office for the Liturgical Celebrations of the Supreme Pontiff has sought to present to the whole Church something of the richness and beauty of the mysteries celebrated during the Holy Year, so that they can continue to nourish ecclesial life and not fade from memory. A similar effort had been made following the 1987/1988 Marian Year (cf. Liturgie dell’Oriente Cristiano a Roma nell’Anno Mariano 1987-1988, Vatican Press, 1990). 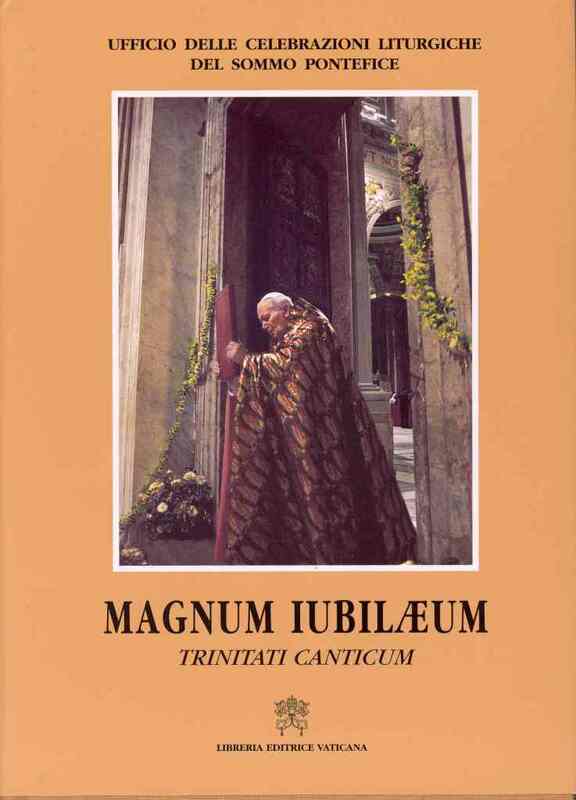 The present volume, entitled Magnum Iubilaeum – Trinitati Canticum, recounts the experience of the Jubilee through the liturgies celebrated by Holy Father. It is offered as a means of remembering and reliving the Jubilee Year through the liturgical texts, rubrical indications and other ritual elements proper to the many individual celebrations. The volume is also meant to highlight not only the great variety of liturgies but also the rich theological and pastoral themes which the Jubilee proposed to the whole Church, as they were reflected in the celebrations of the Holy Father. “‘A river of living water’ the water that continually flows ‘from the throne of God and of the Lamb’ (cf. Rev 22:1) was poured out on the Church. This is the water of the Spirit who quenches thirst and brings new life (cf. Jn 4:14). This is the merciful love of the Father which has once again been made known and given to us in Christ” (NMI, 1). The Jubilee experience needs to be remembered because the event of grace proclaimed by Jesus of Nazareth and celebrated in the Jubilee continues in the life of the Church, a life in which God’s holy people continue their journey of conversion and return to the Father. Putting the liturgical celebrations at the heart of the Jubilee is a way of reaffirming the centrality of the liturgy in the life of the Church, as well as the special importance for the local Churches of the liturgies celebrated by the Bishop of Rome and Pastor of the Universal Church. Thanks to the introductions to the individual celebrations, the perceptive reader will also come to appreciate the great attention and care with which the Office for the Liturgical Celebrations of the Supreme Pontiff prepared the texts and ritual sequences which made the liturgical celebrations the high point of the Jubilee. No Jubilee in history was as well-prepared or so richly and clearly explained as the Great Jubilee of the Year 2000. Pope John Paul II devoted four papal documents to it: the Apostolic Letter Tertio Millennio Adveniente (TMI) on the preparations for and the meaning of the Jubilee (10 November 1994); the Bull of Indiction Incarnationis Mysterium (IC) on its sequence of events (29 November 1998); the Letter on Pilgrimage to the Places linked to the History of Salvation on the significance of pilgrimage and spiritual journey (29 June 1999); and, lastly, the Apostolic Letter Novo Millennio Ineunte (NMI) on the future of hope opening up before humanity at the dawn of the new millennium (6 January 2001). The Apostolic Letter Tertio Millennio Adveniente (10 November 1994) marked the beginning of the whole Church’s preparations for the Jubilee of the Year 2000. The contribution of the Celebrations Office was characterized primarily by study and scientific research. For several decades, as a consequence of the growing impact of papal celebrations due to media coverage and to the Pope’s many Apostolic Visits to different particular Churches, the Office had given increased attention to preparing the various celebrations: meetings of experts, discussions of general issues regarding the papal liturgy, the preparation of texts, worship aids and music, attention to liturgical spaces and the wide gamut of needs and backgrounds. In preparing for the Jubilee of the Year 2000 the Office followed the same method. In view of the Jubilee three Seminars were held in Vatican City with the participation of experts from various nations. The first, from 1-3 February 1996, was entitled: “Papal Liturgical Celebrations for the Jubilee of the Year 2000 in the Light of Tertio Millennio Adveniente. Orientations and Proposals”. The second, from 5-7 October 1998, dealt with the topic: “Texts and Music for the Holy Father’s Celebrations in View of the Great Jubilee of the Year 2000”. The third, from 11-13 February 1999, was entitled: “Television and the Holy Father’s Liturgical Celebrations for the Jubilee of the Year 2000”. This last Seminar, organized with the help of the Pontifical Council for Social Communications, was open to representatives from all television networks interested in broadcasting and providing commentary for the papal celebrations. The conclusions reached by the Seminars [cf. Rivista Liturgica, 83 (1996), n. 2; Rivista Liturgica, 86 (1999), nn. 2-3; Rivista Liturgica 87 (2000), n. 1] enabled the Office to approach the practical preparations for the Jubilee with greater confidence and knowledge. The foundations were laid for a general approach to the Jubilee and, specifically, its characteristic liturgical celebrations. The first Seminar, which dealt specifically with the liturgical celebrations of the Jubilee, was the basis and reference-point for the Office’s activity and, in particular, the celebrations of the whole Jubilee Year. The conclusions of the Seminar also proved very helpful in drawing up the the Calendar of the Year 2000 issued on 21 May 1998 by the Central Committee for the Great Jubilee. The Calendar, republished on 1 November 1999, contained an introduction and a listing of the celebrations for each month of the Year, from 24 December 1999 to 6 January 2001. The contribution of the Office concerned both the list of celebrations and the text of the Introduction. On 4 June 1996 the Office sent to the Secretary of the Central Committee for the Holy Year a number of orientations and proposals for setting the Calendar of the Year 2000. These provided some guidelines for the opening and closing of the Holy Door of the Vatican Basilica – to be opened on Christmas Eve 1999 and closed at the conclusion of the Jubilee – and insisted on the need to respect the structure and content of the Church’s liturgical year. They also called for a variety of celebrations: sacraments, the Liturgy of the Hours, vigils; liturgies of the word and penance services, and popular devotions. It was suggested that the number of the Jubilee celebrations at which the Pope presided should be limited to the major celebrations of the liturgical year and those specific to the Jubilee Year. It was suggested that the Jubilee celebrations should not be presented as primarily directed to particular categories of persons, as happened in the Holy Year of 1983 (cf. Calendar of the Principal Celebrations Planned for the Holy Year, in L’Osservatore Romano, 23 March 1983, p. 2). Indications were also given for celebrations in the rites of the Eastern Churches, on the rites of Canonization and Beatification, and on International Congresses. There was also an insistence on the need for a catechesis regarding indulgences, which would present them mainly in terms of personal and communal conversion and of God’s boundless mercy, and on the need for acts of charity to be incorporated into the Jubilee celebrations. Finally, some mention was made of the settings for the celebrations and the need for an adequate liturgical service in the Roman Basilicas. At the conclusion of the proposals there was a recommendation about the need for a spirit of welcome at every level: “The Jubilee will be a way of witnessing to and making known to all, whether pilgrims or not, the ministry of welcome of the Bishop of Rome, ‘who presides over all in charity’”. After the first Seminar, the Calendar of the Holy Father’s celebrations for the Jubilee Year had already been drafted. In addition to the great celebrations of the liturgical seasons which yearly commemorate the mysteries of Christ, there was an annotated list of other celebrations characteristic of every Jubilee and particularly of the Jubilee of the Year 2000, inspired by themes drawn from Tertio Millennio Adveniente. The celebrations included not only those for the Jubilee Year proper, but also for the three years of preparation. The Holy Father’s celebrations included the opening of the Holy Doors of the Basilicas of Saint John Lateran and Saint Mary Major, which I had personally proposed to the Holy Father in the late summer of 1999. The opening of the Holy Door of the Basilica of Saint Paul had already been scheduled for Tuesday, 18 January 2000, as part of the Holy Father’s celebration of the Week of Prayer for Christian Unity, and as a way of bringing out the particular ecumenical character of the Jubilee (cf. “Calendar for the Holy Year of 2000”, 21 May 1998). The list of Jubilee celebrations drawn up by the Central Committee for the Holy Year in collaboration with the Celebrations Office was then published on 21 May 1998 with the title: “Calendar of the Holy Year 2000”. The text of the Introduction to the Calendar was prepared by the late Father Ignazio Calabuig, O.S.M., a Consultor of the Office, who had already made a significant contribution to the 1996 Seminar. The text - clear, complete and in tune with the spirit and norms of the liturgical year - remained a point of reference throughout the celebrations of the Year 2000. Future Holy Years will also find in this text a sure guide for drawing up a Jubilee Calendar which respects the yearly cycle of the Christian mystery. The list of celebrations which followed the Introduction included some elements which were not always in harmony with the primacy and spirit of liturgical celebrations as recommended by the Office. One thinks, for example, of the oft-repeated recommendations in the Calendar regarding orchestral concerts; the greeting to Marathon runners on the Solemnity of 1 January; the General Audience held on Ash Wednesday. Furthermore, as the Office noted, greater efforts should have been made to limit the listing of jubilee celebrations for specific categories of persons. The inclusion of these last, together with different rites of Beatification and Canonization, International Congresses and World Days, resulted in the celebrations of the liturgical year and the specific Jubilee celebrations being somewhat obscured amid a plethora of other events. In a word, the Office for the Liturgical Celebrations of the Supreme Pontiff would have preferred a Holy Year Calendar based on the sacred mysteries: the liturgical year and Jubilee year. The Calendar of the Holy Year did not have to, and indeed could not, contain every celebration and event which took place during the Jubilee. One need think only of the daily and Sunday celebrations of the various ecclesial communities held in the Roman Basilicas and particularly the Vatican Basilica. Almost every Saturday of the Jubilee Year the Celebrations Office was involved in organizing a celebration of Mass in Saint Peter’s Square for diocesan communities led by their respective Bishops. The Jubilee Liturgical Office established by the Central Committee was of great help in this regard. The Office coordinated and assisted the many celebrations and prayer services, especially those held daily, weekly and monthly. The present volume is divided into three parts. The first part provides the texts of the celebrations; the second, a series of studies; and the third, documentation. The first part opens with a chronological list of celebrations. It contains the most important celebrations which took place during the Jubilee Year in the Vatican Basilica and the other Patriarchal Basilicas, in the city of Rome and during the two pilgrimages which the Holy Father made in 2000. Along with the celebrations listed on the official Calendar, it also includes celebrations notable for the number of those present and for the outstanding impression they made. The name of each celebration is followed by brief but essential notes. The overall list is indispensable for a vision not only of the series of celebrations which marked the Jubilee Year, but also of the presence in the Roman Basilicas of ecclesial communities from throughout the world. Finally, the list gives a sense of the immense work of welcoming, preparation and organization involved in these celebrations. The chronological list of celebrations is followed by the texts of the most characteristic celebrations of the Holy Year of 2000. The texts of the celebrations, including the presentation, the euchological and scriptural texts, rubrics and music, were taken from the booklets for the faithful and the liturgical books prepared for the use of the Holy Father by the Office for the Liturgical Celebrations of the Supreme Pontiff in the course of the Holy Year. Each text is accompanied by a photograph of the celebration. The celebrations range from the preparatory period to the entire Jubilee Year, including some ritual moments dealing with the Holy Doors: the recognitio which took place before their opening and, at the end of the Great Jubilee, their closing. The opening and closing of the Holy Doors of the four Patriarchal Basilicas; the Jubilee in Prisons; the Jubilee with the Disabled. The celebration for the beginning of each of the three years of preparation for the Jubilee; the Commemoration of Abraham; the Pilgrimage to Mount Sinai; the Pilgrimage to the Holy Land; the Day of Pardon; the Ecumenical Commemoration of Witnesses to the Faith. The Mass of the Resurrection of the Lord and the celebration of the Sacrament of Marriage during the Jubilee of Families. The second part of the volume, containing a series of studies, is the most developed. The studies are divided into various sections. The first deals with the five characteristic celebrations of the Jubilee of the Year 2000: the opening and closing of the Holy Door in the Vatican Basilica; the opening of the Holy Door and the ecumenical celebration in Saint Paul’s Basilica; the Commemoration of Abraham, the “Day of Pardon”; the Ecumenical Commemoration of Witnesses to the Faith in the twentieth century. These celebrations reflect the great themes emphasized by the Pope in the Apostolic Letter on preparation for the Jubilee, in the Bull of Indiction and in the Letter on pilgrimage to the places linked to the history of salvation. The third part of the volume is devoted to documentation. It contains the official papal documents dealing with the Jubilee and the text of the Calendar of the Holy Year 2000. Consultation of the volume is facilitated by its useful analytic and thematic index. The studies were prepared by the Office’s Consultors and by others who worked with them in drawing up the various texts and ritual sequences. Each author was involved in some way with the planning and execution of the various celebrations. To them and to all its Consultors the Office expresses heartfelt gratitude. A special remembrance in thanksgiving and prayer is due to Father Achille Triacca, S.D.B., Consultor of the Office, who passed away on 4 October 2002, and had been responsible for the general layout of the present volume. The most important themes of the Jubilee, indicated by the Pope in the documents mentioned above, found concrete expression primarily in the liturgies celebrated by the Bishop of Rome and Pastor of the Universal Church during the three years of preparation and then in the course of the Jubilee itself. Thanks to the celebrations, or rather, the Mystery underlying them, the themes of the Jubilee became moments of grace for the Christian people. A number of Jubilees in the Church’s history, both in the Middle Ages and in more recent times, have been mainly expressions of popular piety. The Great Jubilee of the Year 2000 testified to the primacy of liturgical celebrations, both for the Jubilee itself and for the Christian life, in accordance with the intentions and spirit of the Second Vatican Council, which saw in the Liturgy the source and summit of the Church’s life. Without the experience of conciliar liturgical reform, the Pope’s liturgical celebrations during the Great Jubilee of the Year 2000 would not have had the same central place. It can be said that the celebration of the Jubilee was itself one of the fruits of the Council, and remains in the Church’s history as a sign that the Holy Spirit – to use an expression taken up by the Council Fathers – continues to be present in his Church. The celebrations, in fact, made the Holy Year a unique and uninterrupted hymn of praise to the Blessed Trinity, a sign of the pilgimage of the People of God, a sign of the ecumenical journey undertaken by the Church following the Council, a sign of the mercy of God and the purification of memory in acknowledging the failings of those who, past and present, have borne the name of Christian, and finally a sign of remembrance of the witnesses to the faith. In these celebrations, the themes of the Jubilee found their full value, expression and ecclesial seal. Rooted in the liturgical tradition and grounded in Sacred Scripture, they became part of the Church’s lex orandi. With the Jubilee of the Year 2000, the traditio of the Jubilee Years was enriched by a qualitative progressio, both with regard to theological content and to specifically liturgical aspects. The texts, ritual sequences and non-verbal elements of the celebrations of the Great Jubilee presented in the present volume bring once more to life, now at a distance of several years, the events and the great ecclesial themes of that time of grace. In this way, not only will they not be forgotten with the passage of time, but they will continue to remind believers that the most powerful signs of the Jubilee were part of the liturgy and still accompany the People of God on their pilgrim way towards the Kingdom. In the words of Cardinal Roger Etchegaray, President of the Central Committee and of the Council of the Presidency of the Great Jubilee of the Year 2000, liturgical celebrations “were the heart of the Jubilee” and they continue to be the Church’s heart and life. By re-experiencing those celebrations and the great themes of the Jubilee, believers can rediscover their Christian identity and the basis for their mission in the world. The volume Magnum Iubilaeum – Trinitati Canticum recounts in its own way the events of the Great Jubilee of the Year 2000. The reader who takes care to study the texts and the ritual sequences of the various celebrations will surely discover the thread running through all the events of the Jubilee. It is a matter of recognizing the protagonists of the Jubilee and its succession of liturgies: in other words, all those who made it possible for the Jubilee of the Year 2000 to be an event of grace. The first protagonist to be discovered is the Lord Jesus. The texts and rites of every celebration pointed to Christ the Lord as “the protagonist par excellence” of the Jubilee. Christus heri et hodie, principium et finis; Christus Alpha et Omega. Ipsi gloria in saecula. The acclamation sung at the most significant moments of the Jubilee was a reminder to everyone that Christ remains present in his Church until the end of time (cf. Heb 13:8). Every celebration highlighted the signs of his presence: the Cross, the Gospel Book, the Altar. Often the presence of an icon of the Saviour recalled that he was, and is, the one true Priest of the People of the New Covenant. The Jubilee Door itself was the object of veneration both in the liturgy and in popular devotion for the simple reason that Christ himself is the door of our salvation. Another protagonist was God’s holy people. In their gatherings they made visible the sacrament of the Church. A Church capable of asking pardon, a Church journeying towards the celebration of the Eucharist and the sacraments, a Church capable of accepting a variety of cultures and open to everyone, as symbolized by the Holy Door through which countless throngs of the faithful passed daily. The Church of Rome, called to preside in charity over all, was also a protagonist. Gathered around the Successor of Peter were the holy people Urbis et Orbis, from the City and the world, for the celebration of the one faith, in the Eucharist and the sacraments. The Jubilee celebrations became the supreme moment in the exercise of the Petrine ministry and the most evident expression of the pastoral care of the Bishop of Rome for the Church throughout the world. Every one of the Pope’s celebrations was a powerful and unforgettable moment of universal ecclesial communion. Is this volume, Magnum Iubilaeum – Trinitati Canticum, intended to be a mere nostalgic remembrance of events and people? The truth is that the events recounted here are a testimony to the presence of Church’s life on the way to the Kingdom. The Church’s life is her liturgy, and liturgy is both nostalgia and prophecy. The events recounted here remain in our memory as nostalgia, but they are also a prophecy for the future. As Father Jesús Castellano has written, “the nostalgia of remembrance clings to those extraordinary moments when we wish that time could stand still, that the past not engulf moments which were more than simply ephemeral, but contained something of the mystery of eternity proper to liturgical celebrations. A prophecy of a particular moment experienced as a vision of renewal for the Church, of hope in a new era – the hope of a Church celebrating a constant Jubilee of the spirit in accordance with her vocation and her mission continuing that of Christ, her face constantly set towards the newness and the challenges of the future”.